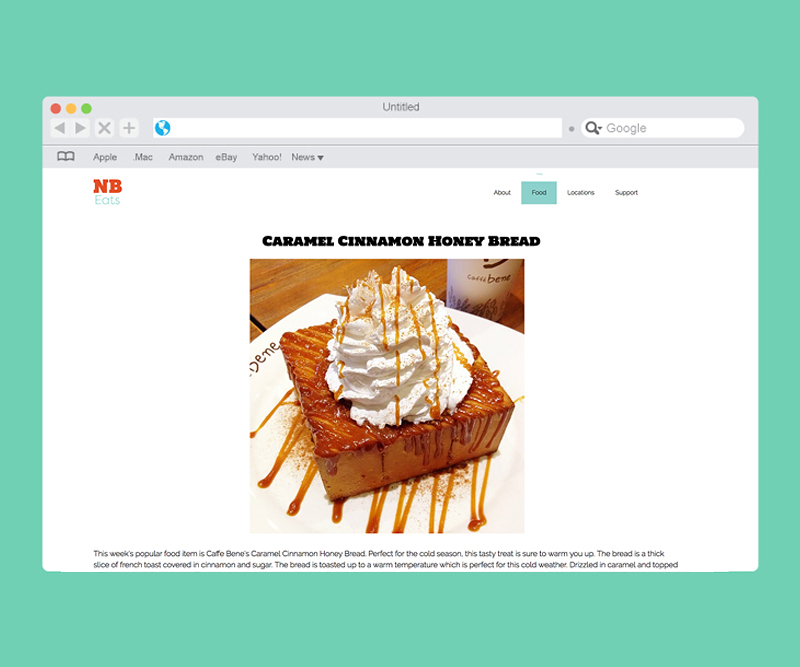 NB Eats was a publication focused on the foodie subculture in New Brunswick, New Jersey. A foodie is defined as a person who has an interest in food. These people will usually go to places to try new food and will upload photos of the food on their social media along with a review of what they thought of the overall experience. If the review is good, more people would be more willing to check out the place as opposed to a badly reviewed place. Since Rutgers University is located in New Brunswick, the potential audience is primarily young adults to adults, ranging from the ages of 18 to 25. From this publication, I hoped to find other people who share my interest in food and would be able to suggest other places to eat in New Brunswick. The initials of New Brunswick are in a Slab Serif font and in a deep orange color where as the ‘Eats’ is in a thin Sans Serif font in a pale teal color. The photos of the food have the teal overlay on them to represent food and eating whereas the places have the orange color filter to reflect the locations.